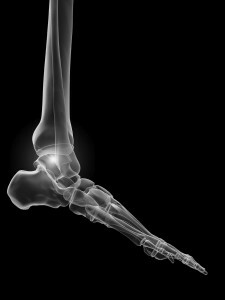 There are 26 bones in the human foot, 28 if you include two sesamoid bones (bones in a tendon). With this number of individual bones you can imagine their complexity of movement coupling involved in even simple movements. In this small section I will not attempt to inform you of all the possible causes of your suffering, instead I will cover a few very common alignments and explain why seeking Osteopathic advise and treatment from could be very what you are looking for. Remember your Osteopath is not just trained in the diagnosis and treatment of back pain, he or she under went a 4-5 year medically based degree covering every joint in the body and is equally happy and competent to treat anyjoint. If you are unsure just give us a call today and we can discuss any concerns you may have. oot. Plantar fasciitis is due to irritation and inflammation of the strong tissue that forms the arch of the foot. Common symptoms of plantar fasciitis include heel and or central underside foot pain with prolonged walking and standing. Sore foot when you weight bare? A heel spur or policeman’s heel is a condition that is closely related to plantar fasciitis. A heel spur is a hook of bone that forms where the plantar fascia attaches to the heel bone. An ankle sprain results when the ligaments of the foot are either stretched too far or tear due to the injury. Treatment of an ankle sprain is important to get back to activity quickly. This is a really common injury and we see many of them each month. Speed up your recovery rate, book your appointment today and get back to full fitness. Do you get pain deep inside your lower leg? A high a sprain is a term used to describe an injury to the ligaments that connect the two bones of the lower leg. The ligament, called a syndesmosis, joins the bones together and runs from the knee to the ankle. In a high ankle sprain, the syndesmosis is injured. This is commonly seen in high impact sports where the nature of the two lower limb bones on impact is to splay apart. Are you suffering from pain or tenderness in the back of your lower leg? Achilles tendonitis causes pain at the back of the calf towards the lower aspect of the leg, and may result in a rupture of the Achilles tendon in severe cases. Pain along the inside of your foot and ankle? Posterior tibial tendonitis is not an uncommon problem of one of the major tendons in the foot. Problems with this tendon can be debilitating and may lead to the arch in your foot being lost. Burning sensations, numbness, tingling or other abnormal sensations including pain in the foot maybe a sign of Tarsal Tunnel Syndrome, a result of a pinched nerve in the back of the foot. While flat feet may not be a problem themselves, they often lead to overpronation, and a predisposition to common overuse injuires. A study has shown that about 20% of adults have flat feet. Due to the changes in the bone articulations pains can develop due to malalignment. Achilles tendon injuries can cause pain behind the heel and difficulty walking. Some Achilles conditions are the result of an acute injury, while others come from chronic overuse. Learn about different problems of the Achilles tendon, and what treatments can help relieve your symptoms. Here at True Alignment we have successfully rehabilitated many such dysfunctions. An Achilles tendon rupture is a common injury seen in middle-aged athletes. Osteopathy can be a great form of treatment for the rehabilitation of a rupture either post surgery or self healing after being in a boot. Treatment options for patients who have sustained a tear of the Achilles tendon. Both surgery and non-surgical treatments are available to patients who have sustained an Achilles tendon rupture. Studies suggest that there is only a very slight benefit from surgical intervention.